Seattle musician Steve Turner is best known as the guitarist for the beloved 90s grunge act Mudhoney, releasing six records between 1989 and 2002 (three on Sub Pop and three on Reprise/Warner Bros.). 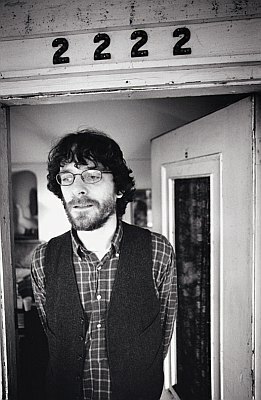 However, Turner has recently redefined himself as a folk songwriter with his debut solo record, Searching for Melody, released on Seattle-based indie Roslyn Recordings. "There are two kinds of music I really like to play - punk rock and folk," Turner tells me. "I grew up on folk. I'm not a rock front man. I'm a guitar player. I've never wanted to front a rock band or anything, never wanted to sing in Mudhoney, but when my voice started to come out, that's just what I sound like." Turner describes his melodic, sing-along folk music "skate folk", half mocking the term "skate punk", the other half encompassing his other hobby. "Skating is one of my other main obsessions," he laughs. For those that feel Turner's dive headfirst into folk is anything but natural, Turner laughs about it and quickly silences his critics. "I expected a lot more people to hate it and go, 'oh boy, another grunge rocker doing the solo acoustic thing'," he chuckles. "But, the reviews have actually been really positive. It's got some reviews that I expected, but it's also got some really good reviews". Everything about the record's conception was natural, much like the laid back, easy-going vibe of the record. Turner would sit in his home, playing his guitar, and slowly things developed. "I never tried singing and playing before," Turner informs me. "I had never done it prior to this. So I would play an hour in the morning and an hour after work, practicing a lot, so I could get better." As he practiced, he got better and better, and finally fell confident enough to accept a show when a friend offered it to him. "The first solo show I played, I was almost in shock," he recalls. "They gave me three months lead time and I was still in shock when I took the stage." The record came about the same way; things just fell into place without really trying. After recording a few demos, word spread like wild fire and Turner soon found himself entering a studio to record the record -- and a label to release it, even though he never intended, even if he recorded the record, to commercially release it. "Mudhoney-- we don't do that much anymore," he explains. "So I got bored and started playing acoustic guitar in the living room. Then Stone Gossard heard some demos and offered me free studio time so I took him up on it. I wanted to make it all acoustic guitar, under the radar type stuff. Press up a few copies and not really tell anyone about it." ed to take shape. Just as Gossard heard demos and offered him free studio time, Seattle music veteran and all around super nice person Barbara Mitchell of Deluxxe Media Management heard her friend Turner was recording a debut solo record. She called him up, told him she was thinking of starting a label, and offered to put it out. The deal was sealed, and her indie label upstart, Roslyn Recordings, would soon release Searching for Melody. Implementing elements of folk, country, blues, and rock, Turner's debut is as sparse as it is moving, as emotional as it is tender, and as simplistic as it is engaging. 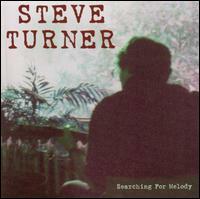 Searching for Melody quickly established Turner as another pivotal Northwest singer-songwriter. Following the album's release, Turner played mostly regionally, but this year he hopes to do a full-band tour with the Sangster brothers -- Young Fresh Fellow's Jim Sangster and Dear John Letters' Johnny Sangster -- acting as his backing band. He is also currently in the studio working on Searching for Melody 's follow-up, which Roslyn Records will release in the fall. "It is more bombastic," he laughs. "I found some more people to play on it; there will be a lot more instrumentation." Following Mudhoney's stint with Warner Bros. Records and their subsidiary, Reprise Records, Turner has seen the ups and downs of the industry first hand. With his solo album, he doesn't care if he sells records or makes money. He's content making beautiful music. When asked his impressions of Searching for Melody when all was said and done and the finished product was in his hand, he playfully says, "I had to make a first record, so I made a first record. Hopefully it has its charms."